On November 25, 2011, the Curiosity Rover will launch aboard a United Launch Alliance Atlas V Rocket as part of the Mars Science Laboratory (MSL) Mission. Mars, the Red Planet, will be the rover's destination in August 2012. Curiosity will spend 23 months after landing gathering samples of rocks and soil. Curiosity is equipped with equipment to drill through rocks, and instrumens to collect samples and distribute to onboard test chambers. Curiosity's goal is to assess whether Mars ever had, or does still have today, an environment capable of supporting microbial life and habitability. 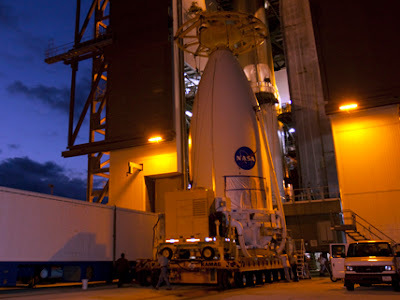 The rocket launch is scheduled for 10:25 a.m., with a window of opportunity lasting until 12:08 p.m. EST on November 25, 2011. Rocket Launch Transportation Tickets (RLTT's) will be on-sale beginning Monday, November 14, 2011 at 12 p.m. EST by calling 866-737-5235.